Did Strong December Payrolls Push Gold Prices Up? December payrolls were strong – but gold prices rose. What happened? U.S. nonfarm payrolls accelerated in December, beating expectations. The economy added 312,000 jobs last month, following a rise of 176,000 in November (after an upward revision) and significantly above 182,000 forecasted by the economists. The number was the biggest increase since February 2018. On an annual basis, the pace of job creation increased slightly last month to 1.8 percent. What is important is that the gains were widespread, but the most impressive expansion occurred in education and health services (+82,000), leisure and hospitality (+55,000) and professional and business services (+43,000). Moreover, the strong headline number was accompanied by significant positive revisions in November and October. With those, employment gains in these two months combined were 58,000 higher than previously reported. In consequence, after revisions, job gains have averaged 254,000 per month over the last three months or 220,000 over the prior 12 months. The chart below summarizes the US nonfarm payrolls over the last five years, showing both monthly and yearly changes. 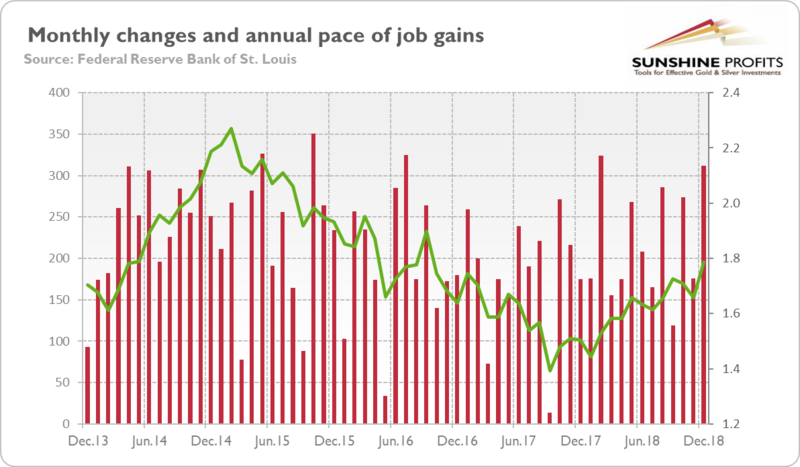 As one can see, the annual pace of job gains has been in upward trend since the fall of 2017, while the monthly gains are significantly above the level that would keep the unemployment rate in check and would please the Fed. Hence, the current economic expansion still has plenty of steam despite growing worries about the slowdown. It is not a good news for the gold bulls. Chart 1: Monthly changes in employment gains (red line, left axis, in thousands of persons) and total nonfarm payrolls percent change from year ago (green line, right axis, % change from year ago) from December 2013 to December 2018. Wait a minute. You wrote that “the monthly gains are significantly above the level that would keep the unemployment rate in check,” but the unemployment rate rose from 3.7 to 3.9 percent in December, as one can see in the chart below.